Handball-Planet.com is proud to announce the results of our traditional Contest for the MIZUNO FEMALE WORLD HANDBALL PLAYER 2015. 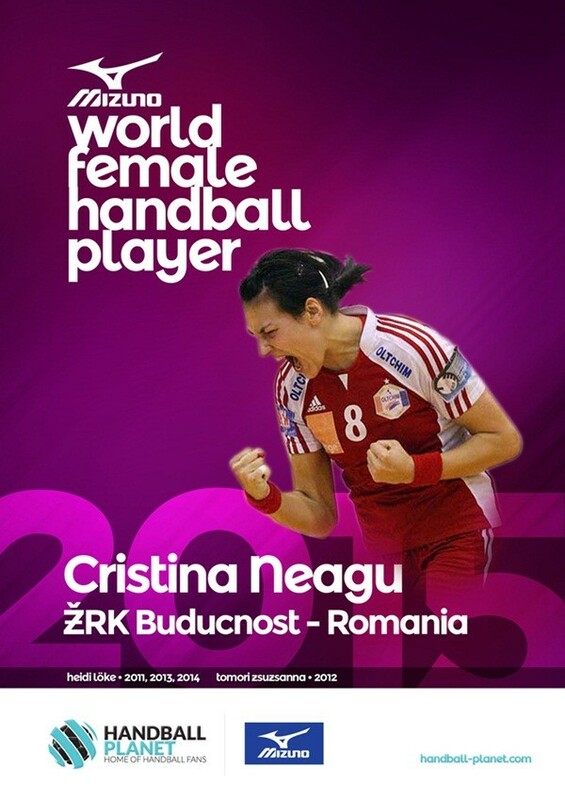 Romanian left back and ŽRK Budućnost Podgorica star, Cristina Neagu, has got the highest number of points based on cumulative votes of 19 members of the international jury of handball journalists and visitors of our website. Her outstanding performance during the Women’s World Championship 2015 in Denmark, where Romania won the bronze medal, but also TOP quality presented in ŽRK Budućnost Podgorica EHF Champions League winning campaign 2014/2015, with good start of the new season, were the best recommendation for this prestigious award. The 27 years-old Cristina Neagu is the third player in five years who win the prestigious award! She succeed Heidi Loke (2011,2013 and 2014) and Zsuzsanna Tomori (2012), girls who won the MIZUNO FEMALE WORLD HANDBALL PLAYER’s awards in the previous years. In three weeks of voting, all of 32 nominated players have got amazing support by the handball community. Handball lovers voted (90.856) for their favorite players in eight categories. Handball-Planet team want to thank all media, teams, TOP players, coaches and handball fans worldwide for making our project so big this year!